Puzzle pieces painted black with a white border. Backlit through cellophane & tissue covered hole of missing piece. White balance at 3200K to give the blue cast. Nice, I like this a lot. Good color and contrast. I wonder if there is a more interesting contrast than black and white? 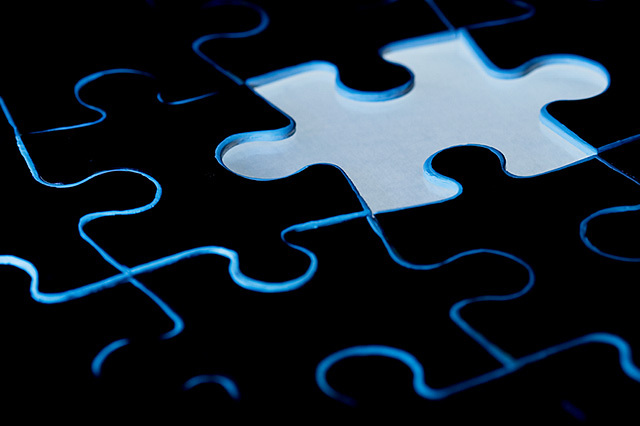 dof could be greater to include the top right portion of the missing piece. Very nice. I like the glowing outline of the pieces. Nice idea, composition, and execution - very elegant. I'd prefer a touch more DOF, but it's still effective as is. I like this very much. I would have liked it more if the white patch under the missing piece had been the same intense blue as the pieces' edges. Very cool idea and nice blue colour. I like the lighting on this one. Good job. what happened in the bottom cm of the image? Why dont the puzzle lines go to the edge? I really like this, but i had to ask about that because its a lttle weird. Nice; I like the blue edges. Proudly hosted by Sargasso Networks. Current Server Time: 04/24/2019 03:52:58 AM EDT.